Gesine Steudle joined GCF in 2013. Her main interests are transition dynamics between socio-economic equilibria, as for example a possible transition between a brown and a green growth path, and the role of prices and money therein, as well as the dynamics of social inequality. She works mainly in the development and implementation of mathematical models taking different approaches into account, as for example Ramsey-type intertemporal optimisations, game-theoretic approaches, or agent-based modelling. 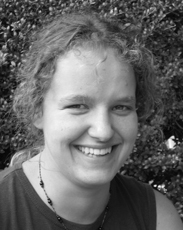 Gesine studied physics in Berlin and Granada (Spain) with a focus on optics and statistical physics. She obtained her PhD from Humboldt-University Berlin in the field of experimental quantum optics. Before she joined GCF she was working at a private consulting company in the area of energy efficiency and renewable energies. Mielke, J., Steudle, G. A. (2017). Green investment and coordination failure: An investors’ perspective. GCF Working Paper Nr. 1. Steudle, G. A., Yang, S., Jaeger, C.C. (2016). Price Dynamics Via Expectations, and the Role of Money Therein. GCF Working Paper Nr. 3.